Welcome to another Foodie Friends Friday! I’m so thankful to know people in the blogging world who want to share their recipes with you! This week, my friend Bernadette from Rants From My Crazy Kitchen is in the kitchen. Let’s get right to it!! Hi everybody! My name is Bernadette Martin, and I run a (mostly) food blog at Rants From My Crazy Kitchen and a Facebook page called My Crazy Kitchen. 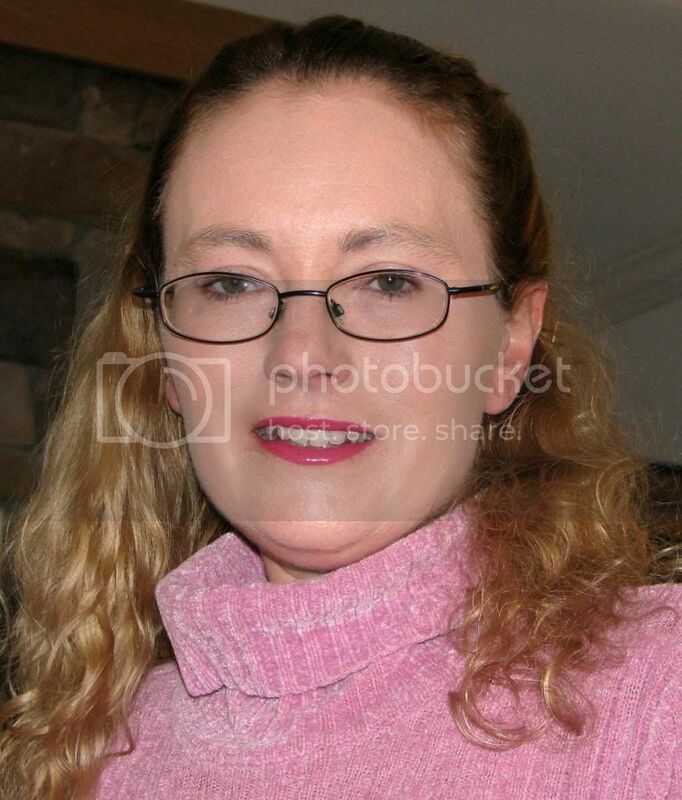 I live in Wilkes-Barre, Pennsylvania with my husband of 7 years (this coming Monday!) with our almost four-year old daughter Amanda and 10 month old beagle named Bella. I’m not always in my kitchen. My daughter (and the dog) keep me too busy for that. Even when I am, things aren’t always calm. So that’s why I chose the name My Crazy Kitchen. When I’m not in my kitchen I can be found cleaning my house, controlling the chaos of a kid and a puppy, and in the summer gardening and just spending time outside! I do love to cook, though, and two of my recipes have been published in a cookbook called Darn Good Eats: The Cookbook for Creative Chefs and Reluctant Cooks by Jodi Ambrose. The recipe I decided to share I made for the first time on Cinco de Mayo this year, Shaved Steak Enchiladas! These came about after I wanted to make shredded beef enchiladas using a beef roast I had frozen and planned on putting in the crock pot with enchilada sauce until tender enough to shred, but my husband insisted he wanted to use the beef for actual roast beef. So, I came up with a “cheat” way of getting what I wanted, and we both loved them! They are almost like a cheese steak in an enchilada, a pretty good idea I think. I hope you think they are just as good! In a large skillet cook the shaved steak with the chopped green pepper and chopped onion until the steak is browned. Drain excess fat and stir in 1 can enchilada sauce and 1 cup Mexican cheese blend. Preheat oven to 325*F. Spray a 9 x 12 baking dish with cooking spray. Lay your tortillas out on a clean surface and spoon an equal amount of steak mixture into the middle of each enchilada. 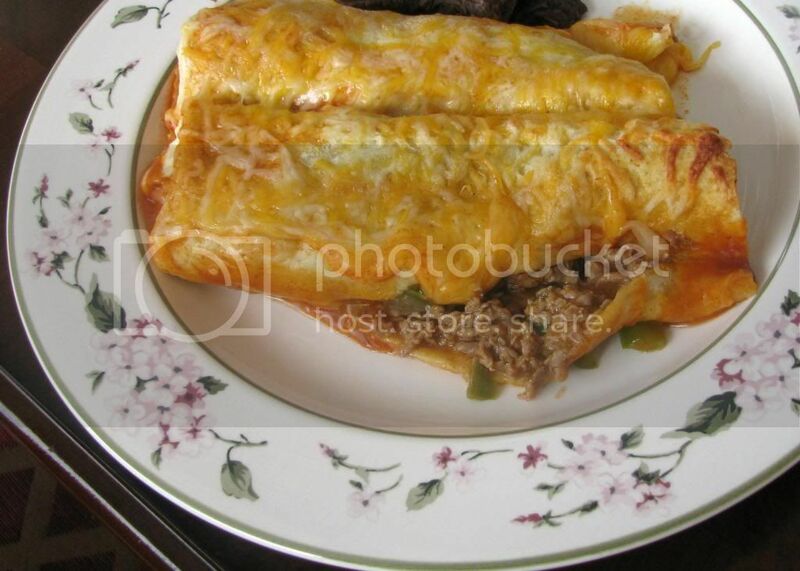 Roll the enchilada up by folding one or both ends up and then rolling to close. 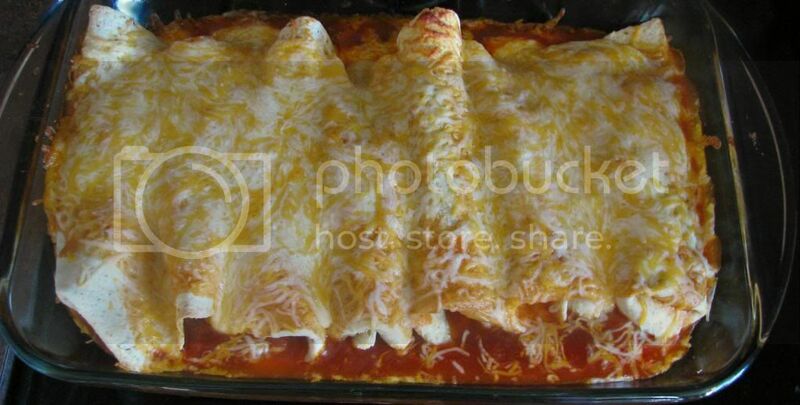 Place the filled enchiladas in the baking dish and pour remaining enchilada sauce over the top. Cover the baking dish with aluminum foil and bake in the preheated oven for 20 minutes. Uncover, top with remaining Mexican cheese blend and return to the oven for 5-10 minutes more, or just until the cheese is melted.